Paying a high price for home audio? Using the power of science and a few everyday household items, you can transform your phone’s built-in speaker into a quality sound system. Whether you’re hosting a party or relaxing at home, nothing sets an upbeat mood faster than loud, catchy music. Most people already have a punchy playlist in their pocket, so all that’s missing is a cell-phone-compatible speaker to amplify the tunes. 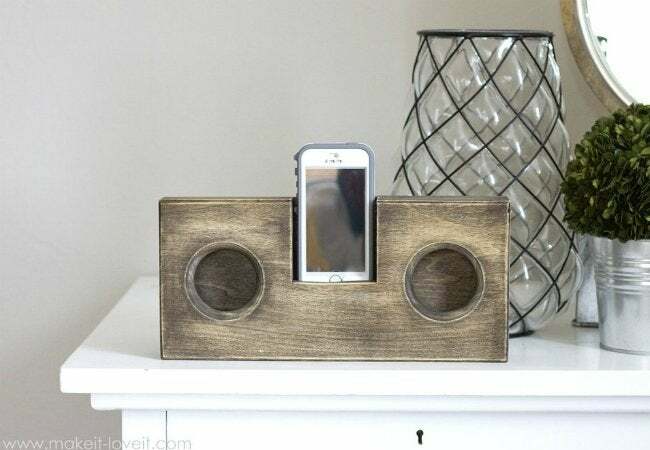 Before shelling out big bucks on a commercial speaker, though, check out the DIY design for a lightweight, all-wood audio system shared by Ashley of Make It Love It. She transformed ordinary lumber, wooden dowel, and wood glue into a supersonic sound solution that consumes zero electricity. 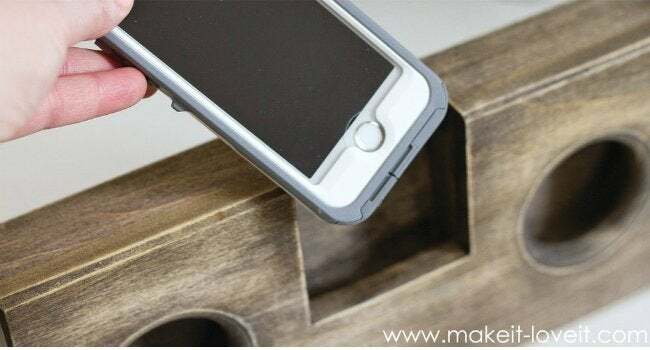 Little more than a 24-inch piece wood plank, the DIY phone speaker functions because of the precise cuts and puzzle-piecing that went into its interior. Front and back of this project mirror one another, except for the roughly 3″-wide cut-out in one (the front) that will hold the base of your phone. Meanwhile, the middle consists only of dowels cut, arranged, and glued between the two panels in a way that channels the sound from an opening precisely aligned with the phone speaker to the cut-out speakers (each 2-1/8 inches in diameter). The result? Crisp, clear audio that fills the whole room when you drop your phone into the cradle—all without consuming additional battery or watt of electricity. Now that’s music to any homeowner’s ears! The benefits of Ashley’s all-wood DIY phone speaker don’t stop with its smart science or low cost. Since the speaker requires no cords or power, you can transport it from the living room or kitchen to your bedroom—even outdoors. This handy speaker allows you to continuously stream your favorite songs without dropping a single beat.